Ali, the narrator of The Memory of Salt, describes drawing a line in the middle of herself (or perhaps himself, as the author never discloses the gender of the narrator), designating one side as Melburnian, the other as Turkish. While her mother is an Australian paediatrician, her father, Ahmet, is a Turkish musician who joined the circus. Ali tells the story of how he and her mother, Mac, met in Afghanistan, fell in love, moved to London, had a child, and became estranged from each other. The thing that made Mac fall in love Ahmet is the very thing that makes him difficult to be around. She was attracted to his carefree, spontaneous nature. The other side of that is domestic abuse and instability. Though he doesn’t accept it, Ahmet is diagnosed with ‘residual, acute, paranoid schizophrenia’. The book weaves together threads of Ali’s memories, her re-construction of what happened before she was able to remember, and her journey to understand her father – the Turkish half of herself. The tone of the novel is mystical and slightly surreal. There are snatches of sentences entirely in German and Turkish usually without translation, adding to a kind of otherworldly feel and a failure to comprehend every aspect of the book. There is also a soft, subtle pain dwelling in the book, the sadness of having a father who is unwell and ungraspable. 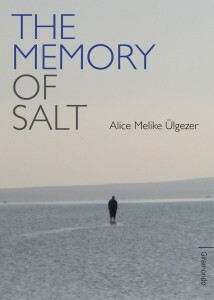 I interviewed the author, Alice Melike Ülgezer about her book, the process of publishing it, and for her reflections on writing. How do you explain the plot of your book to strangers at dinner parties? Well, honestly I never have. I have told people it is set between Istanbul and Melbourne, that it is told across time, place and in different languages and now that it is published, to read it! Did you draw your own life/family experiences for this book? What do you think is the relationship between personal experience and fiction? For me writing is a creative response to life. Through the alchemy of the creative process the boundaries between the real and unreal blur and shift, allowing for ‘real’ experiences to be re-contextualized, displaced and revised. It is a way of re-imagining and re-telling things that have gone before. It is a re-birth, another shifted and altered incarnation of experience. The creative process is a way of digesting experiences. The actual words and writing is the resonance of this process. Did your PhD on the Qadiri Dervishes of Kurdistan inform your fiction? No it didn’t. It came after. But it certainly informs my next creative project. What was the process of getting this book published like? Working with Dr. Ivor Indyk has been an absolute pleasure. Early on he suggested to change two things in the novel, the tense and the narrative perspective. This sounds fairly simple, perhaps a case of search and replace. However, I eventually decided to re-write the novel. The liberation of a blank page was exhilarating and as Dr. Antoni Jach used to say, the first 80,000 words is draft zero, you put them aside and start again. So the process of getting published was hard work yes but also incredibly satisfying to bring the manuscript up to the highest standard it could possibly be. In your Acknowledgements you thank your RMIT Masters’ group for their support. How important is it to bounce ideas off others in the writing process? At different parts of the creative writing process the ideas and reflections of others are important. It is just as important however that these people get your vision, or at least can creatively and philosophically empathise with it. Similarly it is just as important that you maintain your own belief and conviction in your work. This is crucial. There does come a time in the creative process, of a specific project for example, when it is better to share it only with a few people. Furthermore, at other times it can be just as important to remain quiet about your work. To just listen and let it guide you. What advice would you give someone looking to publish their first work of fiction? Have courage and patience and do it because you have to. What are your career plans now? I am currently working on my research into the Qadiri dervishes of Kurdistan at Melbourne University. I am also working on my next creative project as well as two collaborative projects. The first is with a sound engineer of Chailight Productions with whom I am working on our second album. We are working with field recordings I made whilst in Turkey last year. The second project is a collaborative photographic one wherein mystic inspired letters that I have written have been translated into Sorani, a Kurdish dialect and written on mystically significant parts of the body. This entry was posted in Arts, Books and tagged australia, books, Istanbul, lip lit, literature, melbourne, mental illness, publishing, q&a, writing. Bookmark the permalink.